- Cut the apples in half and remove the centers. - Optionally, sprinkle the apple halves with sugar. - Place a few walnuts pieces in the holes created by removing the seeds. 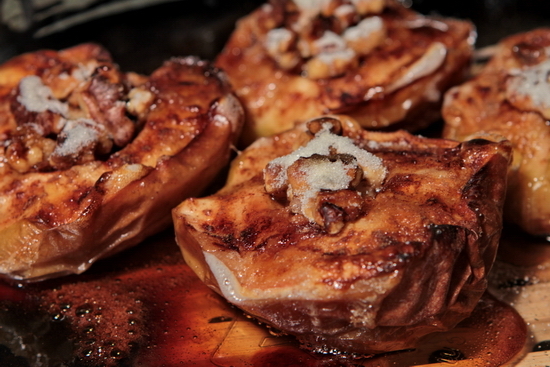 - Generously sprinkle cinnamon all around the apple halves. - Place face-up in a pan and bake in the oven until a fork easily goes into the apples (about 30 minutes). - Serve in a clean plate, accompanied by your favorite ice cream (which can be further decorated with whipped cream and chocolate).